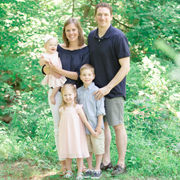 Christmas Eve is reserved for the Rowlands, and Nick has been part of the tradition for three years. We typically celebrate a “progressive” evening at the homes of four family members who live within 20 miles of each other. Each serves one dish — from chipped beef dip to steamed shrimp to burgers in sauce. And the night concludes at my parents’ house with a three tier display of sweet desserts and a rowdy game of “Now You Have It, Now You Don’t” (or “Give It, Take It” as Nick calls it). This year, however, we traveled to Aunt Julie’s house in Belair, MD. Everyone was asked to bring a dish to share, including us, because we’re married now. The pretzels were a hit, and the jalapeño mustard dip was met with much approval by our hot pepper harvesting family. We look forward to trying these with other fillings and dips: pepperoni + mozzarella + marinara, or broccoli + cheddar + Ranch, or even chocolate chips + vanilla cream. What else do you recommend? In a separate bowl, stir remaining 2 Tbsp brown sugar into warm milk until dissolved. 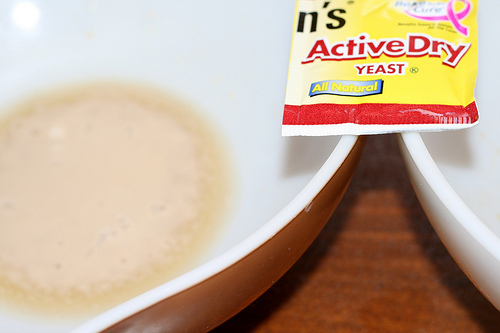 Add 3 cups flour and milk mixture to yeast mixture and stir with a wooden spoon until a soft dough forms. Place dough onto a lightly floured surface and gently knead a few times to form a smooth ball. Transfer to a clean bowl. Cover with plastic wrap and let rise at room temperature until doubled and bubbles appear on surface, about 2 hours. Preheat oven to 400°F. Line sheet pans with parchment paper. Place dough onto a lightly floured surface and cut into 4 equal pieces. 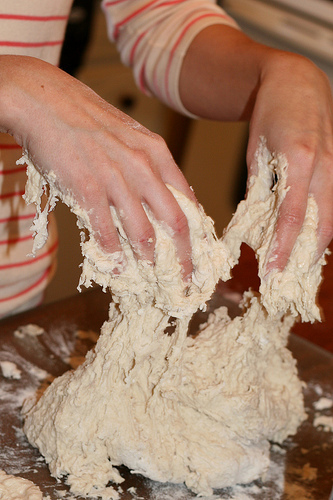 Lightly dust your hands with flour, then gently roll and stretch 1 piece of dough to form a 12-inch-long rope. Flatten dough and arrange so a long side is nearest you, then roll out to a roughly 12- by 4-inch rectangle with a lightly floured rolling pin. Gently press 1/4 of ham and cheese into lower third of rectangle, leaving a 1/2-inch border along bottom edge. Stretch bottom edge of dough up over filling and press tightly to seal, then roll up as tightly as possible to form a rope. Cut rope into 12 pieces and transfer to a sheet pan. 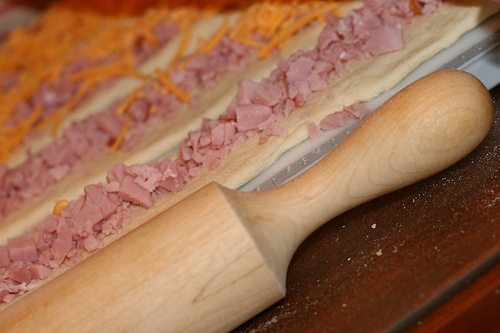 Make 3 more ropes with remaining dough, ham, and cheese and cut into pieces, transferring to sheet pans. 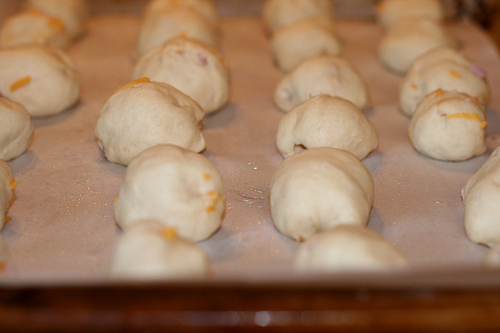 Let pretzel bites rest at room temperature, uncovered for 30 minutes (dough will rise slightly). 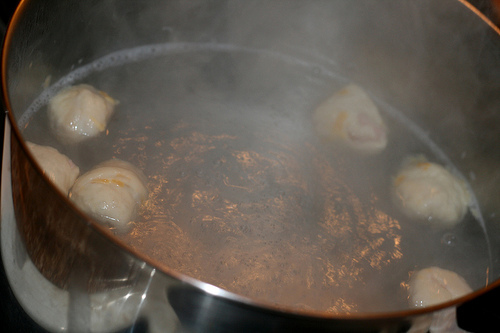 Bring 6 cups of water to a boil. Reduce heat and stir in baking soda. 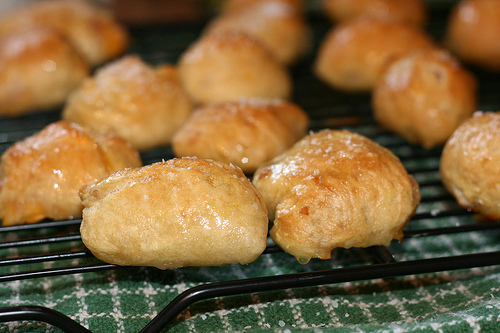 Cook pretzel bites in batches in gently simmering water, turning once, until slightly puffed, about 20 seconds. Transfer with a slotted spoon to sheet pans. Brush warm pretzel bites with butter and sprinkle with coarse salt. Serve warm or at room temperature with jalapeño mustard for dipping. We were in such a rush to finish and package the bites before leaving for the party that we didn’t get any photos of the ooey gooey centers or the jalapeño mustard. Trust us when we say they look just as good as they taste. Wow these look delicious! I think I will make them for my football party later this month. Maybe a batch of ham and cheese and another batch of pepperoni…how many bites does the recipe make? These would be perfect for a football party, Suzy! Each batch makes 48 bites (12 bites per “rope”), and we doubled it. Almost all 96 were eaten! Enjoy. These look lovely. Nice recipe. Nice idea! Wow, you are not kidding with this recipe. Fantastic idea. Christopher would love the jalapeno mustard.